Tennessee quarterback Quinten Dormady throws a pass during Tennessee's first preseason practice on July 29 as head coach Butch Jones watches. Jarrett Guarantano (2) warmsup. The annual Spring Orange and White Football game was held at Neyland Stadium on April 22, 2017. KNOXVILLE — Tennessee football coach Butch Jones had said he was looking forward to seeing the details in the Volunteers' passing game when practice started Saturday. For the first time in his five years as coach, Jones had allowed skill players to participate in player-led seven-on-seven summer passing drills, and he was curious to see what the workouts may have yielded. So far, so good, Jones believes. "I thought it was extremely beneficial for the timing and the rhythm," he said Saturday after watching quarterbacks throw on Haslam Field during a two-hour afternoon practice that served as the beginning to Tennessee's preseason camp. Quinten Dormady and Jarrett Guarantano are competing for the starting quarterback job, and both agreed the summer workouts were beneficial. Both also expressed willingness to play in a two-quarterback system, should a clear starter not emerge. "Whatever helps the team win," Guarantano said when asked about the possibility. Jones said at the Southeastern Conference's media days this month that "if both players earn their right to play, we'll play both quarterbacks." Guarantano said he has never played in a two-quarterback system before but added he would be willing to do it. Dormady jogged his memory to remember a time in middle school when he was in such a system. "I shared some reps with a guy," Dormady said. "But we're just here to win a championship. Whatever that looks like. Whatever we've got to do to get there, I think as an overall team and offensive unit, people are willing to do that. Whatever happens, we'll go with it and do our best and try and get us back to the top." Coaches are not allowed to be present for summer drills, meaning it was up to Tennessee's quarterbacks and other leaders to organize and keep the seven-on-seven workouts going over the past couple months. With three of Tennessee's top five receivers departed from last year's 9-4 team and a new quarterback coming in, the time was used to develop synchronization. 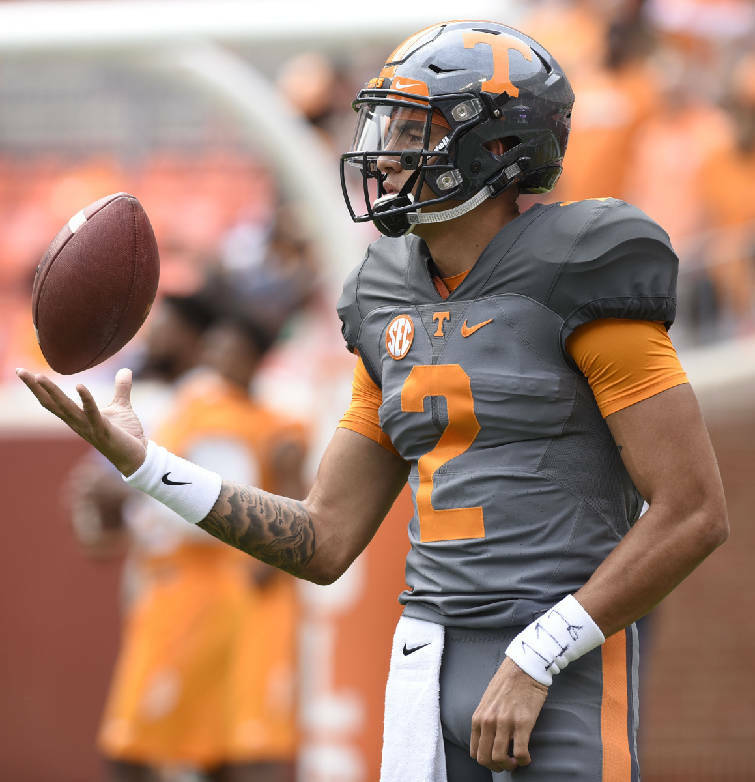 "I think seven-on-seven was able to get some live reps and being able to see some coverages and how the ball is coming on different patterns and that type stuff," Guarantano said. "I think that helped the running backs, wide receivers, linebackers and safeties and cornerbacks." 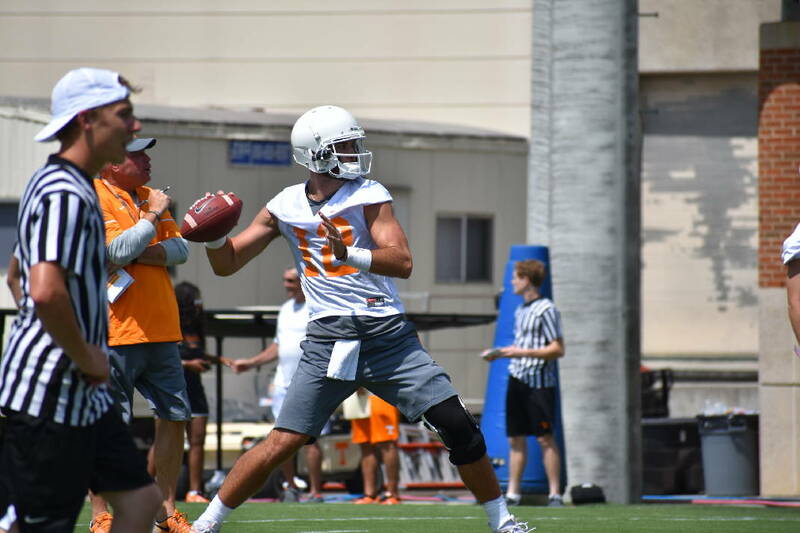 Dormady called the summer work "a good fundamental base." "Coach Jones talks about reps," Dormady said. "That's how you build. It's by getting reps. The more reps we got this summer, the more that was going to help us out. I think that did help us today." The National Football Foundation will honor former Vols quarterback Peyton Manning for his induction into the College Football Hall of Fame during halftime of Tennessee's game against Georgia on Sept. 30. Manning is Tennessee's 23rd inductee into the College Football Hall of Fame. The two-time Super Bowl winner, who played 18 seasons in the NFL, has requested that each of the school's living inductees join him on Shields-Watkins Field during the recognition. A new class of VOLeaders Academy participants were announced this past week. The two-year-old program is a partnership between the UT Center for Leadership and Service, the Center for Sport, Peace and Society, and the athletic department. Participants take a pair of three-hour courses about sports leadership and sports service. The program is capped with a trip overseas, such as the trip to Vietnam several Tennessee student-athletes recently returned from. The 2017-18 participants: Alyssa Andreno (volleyball), Channing Bearden (rowing), Mary Brakefield (women's swimming), Marquez Callaway (football), Katie Cousins (soccer), Brayden Garrison (men's golf), Madison Graham (women's swimming), Darryl Harris (men's track), Allison Herring (women's golf), Abby Lockman (softball), Emily Meier (women's track), Megan Murray (women's track), Nathan Murray (men's swimming), Ariadna Riley (women's tennis), Chelsea Seggern (softball), Trey Smith (football), Garrett Stallings (baseball), Timo Stodder (men's tennis) and Grant Williams (men's basketball).